The war quickly spread, and soon involved the Podunk and Nipmuck tribes. During the summer of 1675 the Native Americans attacked at Middleborough and Dartmouth (July 8), Mendon (July 14), Brookfield (August 2), and Lancaster (August 9). In early September they attacked Deerfield, Hadley, and Northfield (possibly giving rise to the Angel of Hadley legend.) The New England Confederation declared war on the Native Americans on September 9, 1675. The next colonial expedition was to recover crops from abandoned fields for the coming winter and included almost a hundred farmers/militia. They got careless and were ambushed and soundly defeated in the Battle of Bloody Brook (near Hadley) on September 18, 1675. 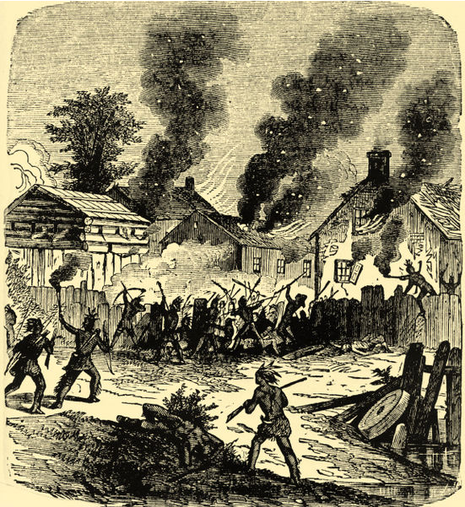 The attacks on frontier settlements continued at Springfield (October 5) and Hatfield (October 16). Brookfield was first settled in 1660 and was officially incorporated in 1718. The town was settled by men from Ipswich as part of the Quabog Plantation lands, though the settlers would be temporarily removed from the lands by attacks during King Philip's War. During the winter of 1776, General Henry Knox passed through the town on his way to Boston with cannon from Fort Ticonderoga to end the Siege of Boston. A marker lies along Route 9 to commemorate the route.